Three lucky senders won return tickets to the Philippines care of Cebuana Lhuillier, in partnership with Cash Express. 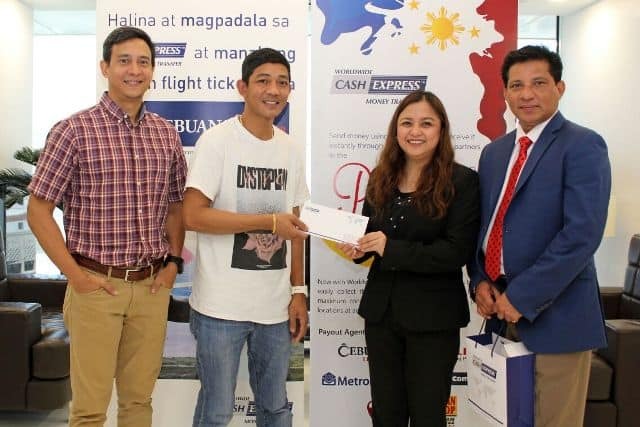 The prize came from a recently conducted promo of Cash Express for Cebuana Lhuillier clients who sent money to their loved ones back in the Philippines from January to April this year. Aside from making Cebuana Lhuillier the preferred pick-up station in the Philippines, the promo aimed to reunite senders to their families back home. Winners Charilyn Angeles and John Paul Malabanan were awarded with return tickets by Head of Cash Express Benny Dacosta, Assistant Vice President and CLSC General Manager Erlinda Sumanga, Executive Asst. to the Vice President James Robert Afzelius, and Cebuana Lhuillier Services DMCC Head for Middle East Maynard Enrile.